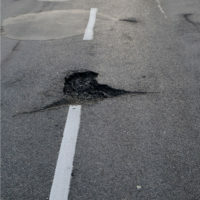 WHAT IF A POTHOLE, NOT ANOTHER DRIVER, CAUSED MY PERSONAL INJURY ACCIDENT? The Pothole Viewer Map provided by the Indianapolis Department of Public Works has so many marks showing complaints that have come in, that the map reminds Indianapolis Star reporter Dwight Adams of a giant angry pimple. Over the winter, ice formed, then thawed, melting into the cracks in the surface of roads and eroding the layers of paving. The resultant damage to cars includes bent wheel rims, mis-aligned steering systems, engine damage, and punctured tires. Collision coverage on your auto policy might pay for the damage to your car, subject to your deductible; your liability insurance (comprehensive) would likely cover the damage you did to another care or property. There might even be some help forthcoming from the City of Indianapolis (see the Mayor’s Action Center App), or, if the incident occurred on a state road, from the state (see https://www/om/gpv/omdpt/2351.htm) . But what about the “biggie” accidents we’ve been hearing about on the news, where there are people being taken by helicopter to the emergency room – or accidents that caused fatalities? Can road conditions be held responsible? If you were recently involved in a car accident and sustained injuries, even if you are convinced the other driver did nothing wrong and that the disaster was caused by poor road conditions, it’s crucial that you contact an Indiana personal injury lawyer right away. You have only have a very limited time to file a claim (the statute of limitations to sue a government agency is shorter than for other claims). Sometimes it’s a combination of road conditions and driver error. Ramey & Hailey works extensively on accidents resulting in catastrophic or permanent loss, whether that loss was caused by driver error or equipment error. For example, if your car or motorcycle was hit by a truck that had swerved after hitting a pothole, that trucking company may be responsible for compensating you for your losses. Our firm is there to investigate all aspects of the incident and to see you get the recovery you deserve.